What is a documentary collection? How does it work? Which parties involved in a typical documentary collection transaction? What types of risks associated with it? Documentary collection (D/C) is a payment method in international trade. Documentary collection is also known as Cash Against Documents (CAD) by most exporters and importers. Documentary collection is more like formal name usually used by bank professionals, whereas cash against documents is a daily life name usually used by importers and exporters. Importers normally pay for the goods after the shipment in whole. But it is also possible to make an partial advance payment under the documentary collections. For example, it is possible to pay %25 of the transaction amount in advance and %75 is payable via cash against documents (CAD). Generally, there are two payment options available under the documentary collections: Documents Against Payment (D/P) and Documents Against Acceptance (D/A). The title of goods belongs to the exporter until the exporter is paid by the importer. But exporter must be very careful about land, rail and air shipments. The transport documents issued under these shipments do not represent the title to the goods. Although banks play an essential role in documentary collections, they neither check or verify the documents, nor take any risks. Documentary collections are less complicated than letters of credit. Also documentary collections are less expensive comparing to the letters of credit. Documentary collection rules, URC 522, published by International Chamber of Commerce, ICC. URC 522 will only be effective if it is incorporated into the text of the “collection instruction“. 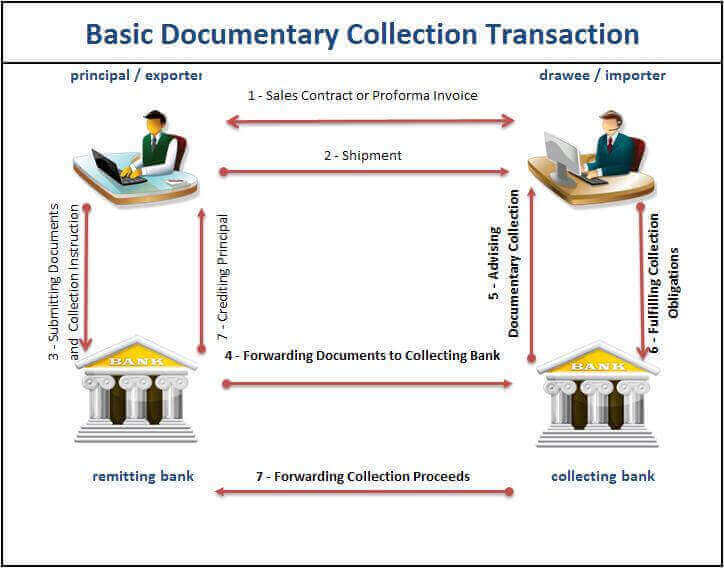 Collection Instruction is a separate document, which the exporter should supply to his bank along with other commercial and financial documents under a documentary collection. Collection instructions are written in a cover letter format and normally should contain below points. Governing Rules for the Collection: As an example “This collection is subject to The Uniform Rules for Collections, 1995 Revision, ICC Publication No. 522.”. Total amount and currency of the documentary collection. 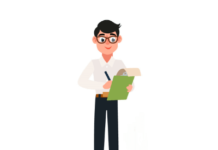 Documents to be supplied: URC 522, the rules of the documentary collections, define two types of documents; financial documents and commercial documents. 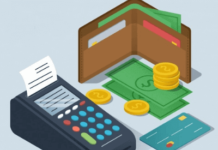 Financial Documents : Financial documents means bills of exchange, promissory notes, cheques, or other similar instruments used for obtaining the payment of money. Documents Against Payment (D/P): Documents may be released only if the importer makes immediate payment according to the contracted agreement between the exporter and the importer. Also known as sight collection. 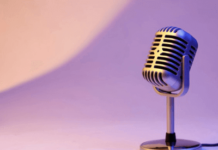 Documents Against Acceptance (D/A): Documents may be released only if the importer accepts the accompanying draft, thereby incurring an obligation to pay at a specified future date. In this arrangement the exporter is exposed to the credit risk of the importer and the political risk of the country. Also known as a term collection. Note: It should be noted that the party preparing the collection instruction should have to clearly define how documents should be handed over to the drawee. If instructing party fails to do so they will be liable for any consequences arising therefrom. Charges: Charges to be collected, indicating whether they may be waived or not and who is going to pay for charges in detail. Instructions in case of non-payment, non-acceptance and/or non-compliance. Almost every bank has its own collection instructions format available to its clients either in electronic format or hard-copy. These collection instructions follow the requirements indicated in URC 522, the Uniform Rules for Collections. Their structure is almost identical. Please click to reach corresponding collection instructions examples provided below. the “presenting bank” which is the collecting bank making presentation to the drawee. the “drawee” is the one to whom presentation is to be made according to the collection instruction. Exporter and importer sign a sales contract indicating the payment method and shipment terms in addition to other details. The exporter makes the shipment. The exporter submits the documents and collection instructions to it’s bank with instructions for delivery. The exporter’s bank sends the documents to the importer’s bank together with the exporter’s instructions. The importer’s bank reaches out the the importer and informing about the documentary collection. The importer fulfills his collection obligations and gets the documents from his bank. The importer’s bank hands the documents to the importer on payment or acceptance of a bill of exchange. What are the Advantages of a Documentary Collection? Advantages of a documentary collection can be examined in exporters or importers perspective. 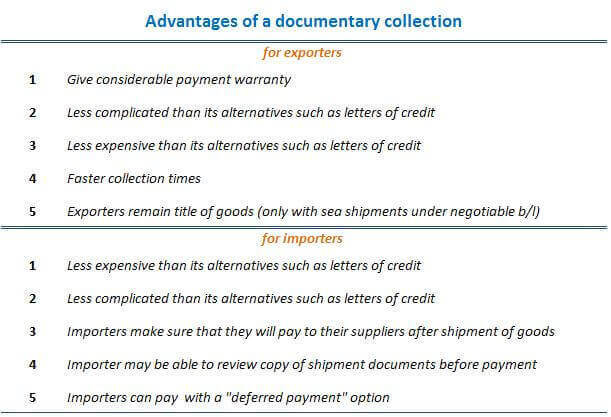 Below figure shows the advantages of a documentary collection for both exporters and importers. Under documentary collections, the documents will not be handed over to the importers unless payment or acceptance of a time draft has been obtained. As importers could not clear goods from the customs without the documents, at least in theory, documentary collections give considerable payment warranty to the exporters. Documentary collections are less complicated than its alternatives such as letters of credit. Documentary collections are less expensive than its alternatives such as letters of credit. Exporters remain the title of goods (only with sea shipments under negotiable b/l) until payment has been received. Under documentary collections, generally, importers make the payment after the shipment of goods. Importers may be able to review copies of the shipment documents before payment. Importers may be able to make the payment after they received the documents from their banks by accepting usance bills of exchange (time drafts). Non-Acceptance of Documents Risk: This is one of the major risk factor in a documentary collection for exporters. Under current documentary collection rules, which are called URC 522, importers are not obligated to collect documents from their banks. As a result exporters have to understand that upon arrival of the cargo to the importing country, buyers may decide not to pay for the documents and simply left goods unclear at the customs. Under such a scenario exporters have couple options. Option 1: Exporters can find another customer to the goods within the country that cargo has arrived. For example if you shipped one container of textile products to Algiers and your buyer do not clear goods from the customs by not having the documents from the bank, then you may try to find another buyer to your goods from Algiers. You may have to give additional discount to make the container attractive to the new buyer. Option 2: Exporters may try to bring back the container to its home country. Option 3: Exporters may try to sell the container to the same buyer under more favorable terms. Non-Payment Risk: Nonpayment risk is the second most frequently seen risk factor in documentary collections. In most cases we would expect to see a nonpayment risk in a documentary collection which is available by Documents Against Acceptance (D/A). Nonpayment risk would be happened if the importer accepts a time draft but not be paying on maturity. Risk of Delivery of Goods to the Importer without Original Shipment Documents: Importers may clear goods from the customs without having original shipment documents on road, air and rail transportation. It is also possible for buyers to receive goods from transport companies under sea shipments if express bills of lading (non-negotiable bills of lading) has been utilized. Under all these conditions as explained above, the importers will be able to receive the goods without the need of original shipment documents, which may lead to a non-payment for the exporters under documentary collections. Low Quality Goods Shipment Risk: This is one of the major risk factor in a documentary collection for the importers. Under current documentary collection rules, which are called URC 522, banks do not check or control the documents. As a result importers pay for the documents without knowing the quality of the goods. This risk is higher when the documentary collection is utilized with “documents against payment” (D/P). Even if the documentary collection is utilized with “documents against acceptance” (D/A), importers may be forced to pay low quality goods according to the local law that governs bill of exchange (draft) procedures.